In everyday language, weight is something that causes a tension in our muscles as they are called on to support our body. It can also be the sensation that we feel when our body is sagging. By this, we don't really mean the tension we get when we are tired. We mean the tension that is due, in some sense, to our body's mass. Physics starts with this "non-physics" everyday meaning of weight and then sharpens it up mathematically and physically to become well defined and quantifiable. But at that point physicists split into two camps, which (for a reason that will be obvious shortly) I'll call the "Contact Camp" and the "mg Camp". The Contact Camp (which includes me) retains the everyday meaning of weight and quantifies it so as always to agree with the qualitative non-physics idea of what weight is. The mg Camp defines weight in a way that only matches the non-physics idea of weight in one special situation. I'll describe each of these definitions in turn. Any time we "feel" our weight, we are invariably in contact with another surface. That surface might be the ground or a chair or a reclining astronaut's seat, and we might be sitting on the beach or accelerating in a rocket. That inspires the Contact Camp's definition of weight, which is "An object's weight is the contact force exerted on it by whatever is supporting it, in any situation." Your weight as defined this way is what is measured by an ordinary set of weighing scales placed between you and whatever is pushing on you (usually the ground). When standing on Earth, your weight won't quite equal the pull of gravity on you unless you are standing at either the North or South Pole. mg − weight = m × acceleration. We are applying Newton's law in the almost completely inertial frame of the Solar System, and if the mass is not at one of Earth's poles, it will certainly be accelerating slightly as Earth turns. So its weight doesn't quite equal mg. This idea of weight recognises that what makes us "sag" is the fact that something is pushing on our body. We don't sag if nothing is pushing on us; the sagging occurs because, for example, the ground pushes on our feet, and that push is communicated up through our body, which stresses our joints and muscles to the extent that we must exert some muscle force to keep our posture: we feel heavy. This contact force depends on your state of motion. When you are freely falling—not a common experience for us humans—you're not in contact with anything, and so you have no perception of weight; you feel no sag. You could try to stand on a set of scales that is falling with you, but you wouldn't be able to press against them, so they would read zero—which is precisely what you expect when you're weightless. At the other extreme, if you're an astronaut lying in a rocket with a high acceleration, both the contact force on you and the effort you must make to support your body (e.g., to keep breathing properly) increases tremendously, and this would again be shown by a set of scales placed between you and your seat. The Contact Camp will say that the astronauts you see floating in the Space Shuttle or tethered outside the Hubble telescope are weightless, and the astronauts working hard to keep thinking straight during a rocket launch have had their weight increased tremendously. This weight of an object is always correctly measured by a set of scales placed between the object and the supporting surface. We could of course place the scales in various places, but if we place them so as to read the maximum value possible, then that maximum value will be the object's weight. Some physicists define the weight of an object to be the force of gravity on it irrespective of anything else: their definition is "The weight of an object equals its mass times the local acceleration due to gravity." This idea of weight is independent of the object's state of motion and doesn't consider any contact force. It is not quite equal to the feeling of heaviness that you have right now as you sit in a chair reading this, unless you're sitting at either the North or the South Pole. Physicists who use this definition of weight will refer to the contact force as "apparent weight". They'll say that when you're freely falling you weigh as much as you do when you're sitting in a chair, although they'll add that your apparent weight is zero in free fall. They'll say that the astronauts floating in the Space Shuttle or tethered outside the Hubble telescope have almost the same weight as they do on Earth (slightly less as g is slightly lower 400 km above Earth's surface), but that their apparent weight is zero. And they'll say that the astronauts working hard to keep thinking straight during a rocket launch have the exact same weight as they do at home in their kitchen, but that their apparent weight has increased. weight (i.e. 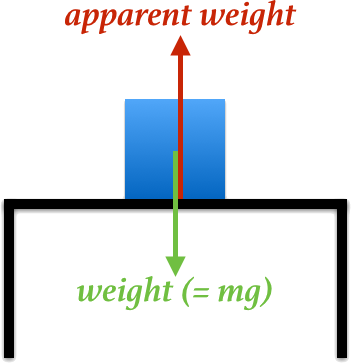 mg) − apparent weight = m × acceleration. As before, the acceleration is measured in an inertial frame. As Earth turns, this acceleration is not zero if the object is not at the Poles, and so its weight does not quite equal its apparent weight. 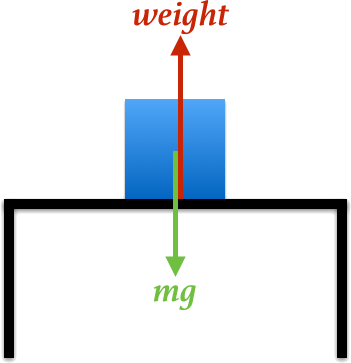 The mg Camp's definition of weight only matches the non-physics idea of weight in the case when the mass is sitting in a gravity field but is not accelerated in an inertial frame. An example of this is a mass sitting at one of Earth's Poles. Which Definition is More Useful? Physics sometimes redefines commonly used words in a way that differs to their everyday usage. One obvious example is "work": when you hold an object in your hand, you do no (physics) work on it, and yet your arm is clearly getting tired. Your muscular system is certainly doing work, but this work is done internally and is not done on the object. So physics has a notion of doing work on something, because that idea turns out to be useful in mechanics. Given the option of retaining the everyday use of "weight" or redefining it, what's the best course? I think that if there's no useful reason to redefine a word then we shouldn't, especially when that word has been in the public domain since time immemorial. That's why I'm in the Contact Camp, because I find no useful reason to discard the commonly understood meaning of "weight". As it is, physicists find it hard enough communicating their ideas to non-physicists through a sometimes-esoteric language; so must we also redefine commonly used words that don't need redefining, just for the sake of it? Another point worth pondering is how these two definitions of weight might dovetail with Einstein's theory of gravity. Einstein's theory draws a quantitative comparison between the measurements of an observer inside an accelerating rocket far from gravity with those of a non-accelerating observer in a gravitational field. The Contact Camp will say that both observers feel weight, and so this camp has no problems making the comparison required by Einstein. In contrast, the mg Camp will say that the rocket observer has no weight (because there is no gravity in the rocket: g is zero), and that the observer in the gravity field does have weight (because g is non zero there.) To insist that the experience of the rocket observer is "apparent" while that of the observer in the gravity field is real goes against the principle of relativity. Yes, the mg Camp will say that both observers have an apparent weight; but because they differentiate between apparent weight and mg, they have taken the focus away from what Einstein is really addressing: gravity, g.
Imagine some phenomenon occurred that made Earth spin gradually faster and faster. Eventually it would be spinning so fast that the Equator and everyone on it would be moving at the speed of an object in circular orbit near Earth's surface, about 8 km/s. If you were positioned at the Equator, the gravity force on you would exactly provide the centripetal force that keeps you moving in a circle in the Solar System frame, so the ground would not push up on you. You would be floating! Now move away from the Equator (you'll have to push on something, or fire a little rocket to get moving) where the ground is moving at slightly less than 8 km/s, and you will gracefully lose your ability to float, little by little. Close to the Equator you would find yourself just settled on the ground, only marginally registering a non-zero reading on a set of weighing scales. The farther you moved from the Equator, the more you'd find yourself pinned to the ground. No one would deny that at the Equator you felt a complete lack of bodily sag, along with an amazing ability to float about. So would you describe your perception of (a lack of) weight at the Equator as real (the Contact Camp) or apparent (the mg Camp)? What is so "apparently weightless" about floating like a levitating saint? And what is so "apparently increasing in weight" about finding yourself sag more and more the farther from the Equator that you move? For the second thought experiment, put yourself in the seat of a Saturn V rocket ready to lift off for the Moon. Or rather, you had better lay yourself in that reclining seat, because when those five huge nozzles at the base light up and each pumps out an astounding 40 million horse power for the next two minutes, you'll be pushed back into that seat so hard that I'm sure you'll be thinking there's nothing apparent about your sudden increase in weight!